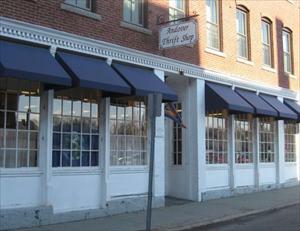 The Andover Thrift Shop is located at 10 Park Street in downtown Andover. Store hours are Monday through Friday 10 a.m. – 4 p.m., and Saturdays from 10 a.m. – 2 p.m.
We close annually for the month of July. For more information, please call the shop at 978-475-0957 or go to our website, www.andoverthriftshop.com and keep up with our news on Facebook. You can also e-mail the Shop at andoverthriftshop@comcast.net. Beth Barnard is the Manager of the Andover Thrift Shop, and Missy Blanch is the Assistant Manager. The first Thrift Shop was opened in February 1941 in a tiny store front on Post Office Avenue by a small group of women from the parish in an effort to raise funds for Christ Church. Starting with $50 in capital loaned by the Vestry, the founders successfully begged donations from parishioners and friends. The Shop outgrew that store front after two or three years and moved across the street to the Musgrove Building. By that time we were accepting goods on consignment from all over the Merrimack Valley. In June 1961 the Shop moved again to 26 Chestnut Street. Business continued to improve and in May 1964 we made our final move to 10 Park Street. With money advanced by the Thrift Shop, the building was purchased by the parish in 1970 and by 1976 the mortgage was retired. The Shop is truly ecumenical in spirit since we welcome volunteers of all ages and faiths who are willing to contribute to our ministry. The Shop provides a service to our town and surrounding communities by making available gently used clothing and household items while at the same time playing an important recycling role in preserving our environment. Approximately 100 volunteers work in morning or afternoon shifts each weekday in groups of three or four, along with several “working folk” who volunteer time on Saturdays. Business continues to expand and we are always in need of new volunteers. The Thrift Shop provides a wonderful community of caring and support, not only for those who volunteer their time, but also for customers and donors alike. We welcome donations of gently used items during the last two weeks of each month except June and July. Items not sold after a period of time are moved downstairs to the sale racks. Anything left after another month is brought by a volunteer to shelters and senior centers in Haverhill and Lawrence, and any leftovers go to Lazarus House. Unsold children’s clothing is given to Neighbors in Need in Lawrence, and household items are brought down to Mission of Deeds in Reading. Well worn linens go to the MSPCA in Methuen. Quite a recycling operation! Aside from an annual pledge to the program budget of Christ Church, the remaining proceeds are used exclusively to fund improvements and maintenance of the buildings and grounds of the parish as set up in the Thrift Shop’s original charter.